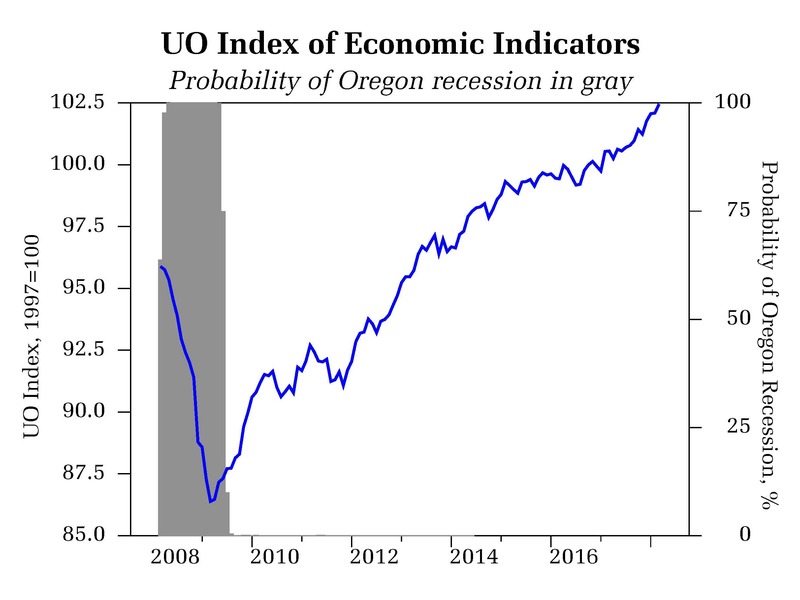 This is the University of Oregon State of Oregon Economic Indicators for March 2018. The release date is May 7, 2018. Special thanks to our sponsor, KeyBank. The moving average measure, which smooths out the volatility, slid to 1.09, well above average. (“zero” indicates average growth over the 1990-present period) but cooling somewhat compared to the run-up at the end of 2017. The construction sector made a modest negative contribution to the measure, weighed down by weaker employment components; new housing units permits made a nearly neutral contribution. A softer stock market compared to last year has reduced the contribution from that sector to nearly neutral. Consumer sentiment, however, continues to add positively to the measure. 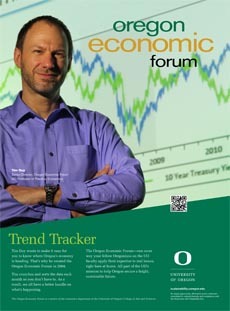 The University of Oregon Index of Economic Indicators gained for a fourth consecutive month, rising 0.4 percent. Initial unemployment claims continue to bounce along sideways at very low levels consistent with economic expansion and ongoing job growth. Trucking activity as measure by the Oregon weight distance tax continues to rise, reaching a new cycle high and indicating gains for Oregon’s traded-sector economy.